Unai Emery’s debut season at Arsenal could still go both ways, as the Gunners fight to secure Champions League football for the next season. They have two options at the moment – to finish in Premier League’s top four or win the Europa League. Emery wouldn’t mind doing it either way but given the fact that he has already won three successive Europa League titles with Sevilla, we believe he will definitely go for his fourth trophy in the competition. Carlo Ancelotti and Napoli will probably finish second in Serie A. They entered the Europa League after finishing third in the group stage of the Champions League and eliminated Zurich and Salzburg on their way to the quarter-finals. Arsenal’s captain Laurent Koscielny and midfielder Granit Xhaka are racing to be fit for Thursday’s encounter against Napoli. Sokratis Papastathopoulos is back from suspension for Arsenal after missing the second leg against Rennes and is expected to be in the starting line-up, while striker Danny Welbeck is still sidelined. Lorenzo Insigne made his comeback from injury in Napoli’s 1-1 draw at home to Genoa on Sunday, but will probably start on the bench at the Emirates. Amadu Diawara and Raul Albiol will most likely miss the trip to London, while Kalidou Koulibaly and Nikola Maksimovic are back in the squad after missing Napoli’s last European encounter through suspension. Unai Emery has confirmed Xhaka and Koscielny are doubtful for Thursday’s clash against Napoli. “I don’t know. Maybe Laurent could’ve come back to play today but yesterday we knew it wasn’t possible. I want to be positive for Thursday but it depends how he’s progressing,” he said after the 1-0 defeat to Everton via Arsenal’s official website. “Xhaka is the same. They are doubts for Thursday. We have players and we know we can produce the performance with all the players. When you lose a match, maybe you can look at the players who didn’t play, but it’s rarely the consequence. Napoli boss Carlo Ancelotti believes his team needs to work defensively before their trip to the Emirates. “We’re defending badly at the moment, even when it was 11 against 10, and that means we cannot control the game,” he said via the Sun. “If you control the game, you don’t allow counter-attacks, you don’t let the opposition to turn and run at you. It’s an alarm bell, certainly, because if we play like this in London, then we’re in trouble. Arsenal have won their last seven home games in all competitions, scoring a total of 19 goals and conceding only two in the process. Both sides met each other in the Champions League group phase back in the 2013/14 campaign, as both games finished with a 2-0 victory for the home side. Napoli have lost seven and drawn one of their previous eight away matches against English opposition. 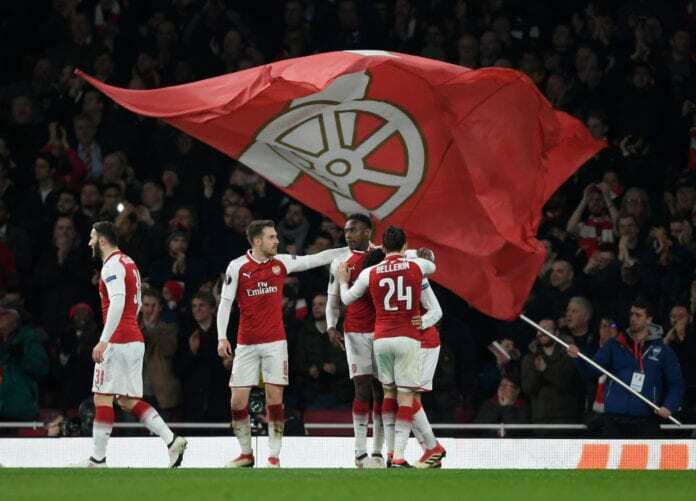 The Gunners have won their last two Europea League home games with the same scoreline, 3-0 against BATE and Rennes respectively.